Check here for recently released reports from the Mt. Laurel Township Police Department. The Mt. Laurel Township Police Department has reported that on July 12 at 11:11 a.m., patrols responded to the area of Route 73 and Beaver Avenue for an alleged lewdness complaint. According to police, a witness reported that he observed an older male, with a bald head and an average build, driving naked on Route 73 in a late model, silver Honda Accord. Police say the witness also reported that the male appeared to have been pleasuring himself while driving. According to police, patrols could not find the vehicle in the area. On July 16 at 5:57 p.m., patrols responded to a business on the 800 block of Union Mill Road for a theft. A loss prevention employee reported seeing an employee steal $50 from a cash register and conceal it in his pants pocket. A 58-year-old male from Moorestown was arrested and charged on a summons with theft. He was processed and released. On July 16 at 8:54 a.m., patrols responded to a dealership lot on the 4100 block of Church Road for a theft. An employee reported that between July 14 at 6 p.m. and July 16 at 6 a.m., an unknown person removed and stole the wheels and tires from two vehicles that were parked in the lot. On July 16 at 4:37 a.m., patrols responded to the area of Creek Road and Centerton Road for a suspicious vehicle complaint. Patrols located the vehicle, which was driven by a 24-year-old female from Mt. Laurel. The investigation revealed that the driver was under the influence of prescription medication, which negatively affected her ability to operate a vehicle. She was subsequently arrested and charged with DUI and other motor vehicle violations. She was released to a family member. On July 15 at 10:22 p.m., patrols responded to the basketball courts on Union Mill Road at Larchmont Boulevard for a report of a theft of a wallet. The victim reports that while playing basketball, a male with a beard wearing a white t-shirt and red basketball shorts stole his wallet. The person then left the area down Union Mill Road towards Ark Road. 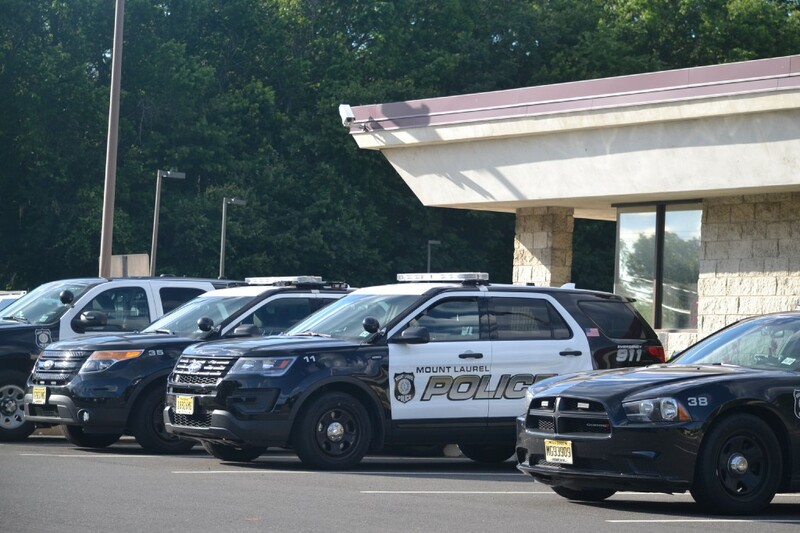 On July 15 at 8:55 p.m., patrols conducted an investigation into an occupied suspicious vehicle in the lot of a motel on the 1100 block of Route 73. During the investigation, it was determined that a 36-year-old female from Springfield, Pa. was in possession of a crack pipe. The female was subsequently arrested and charged on a summons with possession of drug paraphernalia. The female was also determined to be a fugitive from justice out of Delaware County, Pa. She was committed to the Burlington County Jail pending extradition. On July 15 at 7:44 p.m., patrols responded to the area of Route 38 and Marter Avenue for an erratic driver complaint. Upon arrival in the area, patrols located a vehicle in the parking lot of Wawa. A 40-year-old male driver from Mt. Laurel was asleep behind the wheel in the vehicle. During the investigation, it was determined that the male was under the influence of narcotics. He was subsequently arrested and charged with DUI and other motor vehicle violations. He was released to a family member. On July 14 at 10:20 p.m., an officer conducted a pedestrian stop on Route 73 in the area of Ramblewood Parkway. During the investigation, it was determined that a 47-year-old male from Camden was in possession of a glass pipe, used to smoke crack cocaine. Additionally, the male provided a false name to avoid being arrested on a warrant that he thought was active. He was arrested and charged on a summons with hindering his own apprehension, possession of drug paraphernalia and jaywalking. On July 14 at 10:46 a.m., patrols responded to a residence on the 600 block of Orchard Way for a report of a theft from a motor vehicle. The victim/resident reported that sometime between 8:30 p.m. on July 11 and 10:46 a.m. on July 14, an unknown person entered her unlocked vehicle and stole approximately $20 in loose change. On July 12 at 9:11 p.m., patrols responded to Ruby Tuesday on the 4000 block of Dearborn Circle for a report of a theft from a motor vehicle. The victim reported that between noon and 9 p.m., an unknown person smashed the passenger side window of her vehicle and stole her purse. On July 12 at 4:41 p.m., patrols responded to the Funplex for a report of a theft from a motor vehicle. The victim reported that she parked her vehicle in the parking lot of the Funplex between noon and 4:30 p.m. When she arrived back to her vehicle, she found that the passenger side door window was smashed and her Coach purse and contents were stolen. On July 12 at 3:16 p.m., patrols responded to a residence on the 100 block of Waverly Avenue for a report of a theft of a ladder. The victim/resident reports that according to his surveillance cameras, at 4:12 a.m. a male, average height and thin build wearing a white t-shirt and white shorts, entered his yard and stole a 24-foot extension ladder. On July 11 at 9:46 p.m., patrols responded to the area of Route 38 and Briggs Road for a report of a serious motor vehicle crash. Due to the crash, there were multiple injuries. All injured people were transported to local hospitals for treatment. The investigation revealed that one of the drivers, a 35-year-old male from Mt. Laurel, was under the influence of alcohol and/or drugs. On July 11 at 4:38 p.m., a victim who resides on Kettlebrook Drive came into headquarters to report a theft of a package from his doorstep. The victim reported that on July 9 at 1:44 p.m., a package was delivered to his residence. He did not receive the package and assumes that an unknown person stole the package from his doorstep. On July 11 at 11:19 a.m., patrols responded to the area of Route 38 and Ark Road for a report of a one vehicle motor vehicle crash. Upon patrols arrival, the officers found the driver of the vehicle to be slumped over behind the wheel, apparently suffering from a drug overdose. Narcan was administered and the 29-year-old male driver from Mt. Laurel regained consciousness. He was charged on a summons with DWI and various motor vehicle violations, possession of hypodermic syringes and possession of drug paraphernalia. He was transported to a local hospital for treatment. On July 10 at 9:47 p.m., patrols responded to the area of Schoolhouse Lane for a report of a motor vehicle crash. The investigation led to the arrest of a 29-year-old male from Philadelphia for driving while intoxicated. The male was charged with DWI and multiple other motor vehicle violations. He was processed and released pending a future court date. On July 10 at 12:50 p.m., patrols responded to a gas station on the 3600 block of Route 38 for a report of theft of gas. The employee reported that a male in his mid-40s driving a Mercedes S-Class requested $10 worth of gas. The male went into the store and advised the gas attendant that he was going to pay for the gas inside. After leaving the store, it was determined that the male never paid for the gas.